The results Saturday from Colorado Springs were not what fans were looking for. Followers of the Bulldogs wanted to be reassured their team was “back” with a convincing win like last…Saturday…in Mankato…Wait, that Mankato game was supposed to be the statement game, the one to quell fears and angst. What went right Saturday? Reiter played well making the stops he needed to keeping UMD in the game. This past weekend is proof positive that UMD needs to go with Reiter until he proves he is not up to the task (I know that this is going on and on, week after week, but it NEEDS to happen). The Bulldogs also never trailed in the game. But that is a double edged sword in that UMD then gave up the lead at least once. Actually, the game went every time the Bulldogs scored, the Tigers would answer to tie. Not that great of a positive. What went wrong? Two goals came on the power play, but a five-minute major on CC went with very little pressure and organization by UMD. That is the time to cash in at least once, and really for multiple goals to salt the game away. Chances squandered. The most painful part is USCHO now has the TUC record right on the PWR rankings. UMD is 19-8-6 overall good enough for 8th best in the nation. But the TUC record is lousy, only 10-8-5 and that is up since UAA beat Alaska Saturday night to become a TUC again. Stock Dropping. During the past weekend at CC, UMD’s PWR fell from #7 to a tie for #11. Yes, 16 teams get into the NCAA Tournament, but really it is 15. No, this is not fuzzy math; it is the fact that every conference gets an atuo-bid to the tourney. Current ACHL leader RIT is at #26 in the PWR, so whoever wins that tournament will be a “spoiler.” Add in any other non-top 15 PWR team that wins their conference tournament and we winnow down the at-large openings. The Bulldogs hit Thanksgiving with an 11-1-2 overall record and an 8-1-1 mark in WCHA play. Since then, UMD has gone 8-7-4 overall , 6-6-4 against conference opponents, and hasn't won consecutive home games. Those stats say a lot. It causes some to have painful memories of last season’s second half meltdown. The good news is UMD has two regular season games to go and the prospect of the WCHA playoffs to solidify their standing for the NCAA Tournament. Why again this end of season blight? Are NCAA hopes starting to slip? Bulldogs drop in PWR from #7 to “bubble-land” at #11. The win for CC propels them from #19 to #15, the other end of "bubble-land." The shame is the offense is playing well. It is starting to sound like a broken record, but the whole team defense needs to come together post haste. The Bulldogs get their chance with CC again tonight to gain yet another split. Two weeks to go and home ice is for UMD is set. Now it is about bettering position and getting physically and mentally ready for the tournaments to come. The goal is still top two in the conference looking ahead to the new Final Five format. He’s Back. Jaden Schwartz returned to the Tigers a week earlier than expected when he played against Bemidji last weekend. He played well after a 15 game layoff tallying a goal and two assets. The team didn’t fare as well tying and losing to the Beavers. Home Ice Wanted. As stated, UMD has home ice locked. CC is looking to make a move from bottom half to top half of the conference and getting home ice in the first round. Currently the Tigers trail UMTC by one point with four games remaining. UMTC holds the tie breaker against CC and has MTU and @ BSU remaining on their schedule. Meanwhile, CC has UMD this weekend and @ Wisconsin to end the regular season. Get the Lead. The Bulldogs are a staggering 9-0-0 when leading after the first period and 14-0-1 when leading after the second. Conversely, CC is 0-14-0 when trailing after two periods. Looking at the other side, UMD is 1-6-1 when trailing after two periods and CC is 15-0-1 when leading after two. Fast Starts. Momentum can be gained and lost by goals early in the period and late in the period. The Bulldogs need to be ready when taking the ice each period as CC has 16 goals this season in the first three minutes of a period. The latest came at 1:09 of the third period in last Friday’s game at BSU. Outcome. CC needs these games if they plan on staying home for the first round of the playoffs. They will be motivated. What does UMD have to play for? A lot and it has been that way for weeks. Heck, they used to be tied for first in the WCHA! So what is going on with the losses? Players in, players out, it doesn’t matter, the team needs to play complete games, play defense, and win games. All taken into account, UMD will likely split this weekend with CC. If the Reiter plays both games, UMD will take at least three points. But it looks like the goalie rotation continues so split it is. Around the WCHA. Mankato is off this weekend and UAA plays non-conference against Alaska. Bemidji State at #2 North Dakota (Sat./Sun. ): in a rematch from earlier in the year, the Beavers and Sioux meet again. Last time UND took three points. BSU seems to be going on a little roll here with a three point weekend against CC. But UND is on a bigger roll as they move to capturing the McNaughton Cup. A tie on Friday leaves the Sioux with three points again. #4 Denver at #8 Nebraska – Omaha: by far the most intriguing matchup of the weekend. We will get to see if the Mavs can weather a top team of the WCHA as they continue to climb and surprise in the conference. The UNO sweep of Wisconsin gives us the belief that UNO and Denver will split this series. #14 Wisconsin at Saint Cloud State: SCSU rising, UW falling? This weekend will be telling to see if Wisconsin is for real this year. We will still not be sure when these teams split the series. Michigan Tech at #18 UMTC: Tech may have some jump, but not enough. UMTC win Friday and tie Saturday for three points. UAA and Alaska (home and home): Great rivalry between two teams that having decent years. In most games that mean so much to the participants, this will end in a split with home teams winning. Moving into the last weeks of the regular season, UMD continues to struggle at times. With the split last weekend at Mankato, the Bulldogs have not lost back-to-back games this year while amassing a 19-7-5 record. 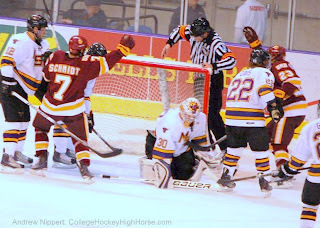 While in Mankato for Saturday’s game, we witnessed the potential scoring power of UMD in a 6-2 win. The score makes the game appear like a one-sided game. It wasn’t. What made this game closer than a first glance was the shaky defense. The defense concerns start with goal. Coach Sandalin has not come out and declared a number one goalie. At this point he either should make a declaration, or just play Reiter until he proves distinctly that he is not worthy. Crandall has a good winning percentage, leading the WCHA with 0.808. But hidden in that stat are the basics. Crandall has a GAA of 2.57 and a save percentage of 0.900, right on the border of decent and dismal. Crandall has been blessed with scoring in front of him, thus the winning percentage despite he saves percentage. At this point in the season, UMD needs their strongest goalie to get the starts, and that goalie is Kenny Reiter. Kyle Schmidt helps celebrate JT Brown's first of two goals. Three Stars. “As voted on by the media….” I wasn’t given a ballot and am frankly surprised and left in wonderment of who was chosen as the "three stars" for Saturday’s UMD win. Schmidt, Faulk , and Oleksuk were chosen for having played a game and each tallying three assists. I can understand that, but what was left on the table was JT Brown and Mike Seidel who each scored two goals. I would have voted for both as they stepped up and propelled UMD to the win. In other WCHA action, loses and a tie by the top teams Friday night left an opportunity squandered for the Bulldogs to move up. There aren’t many chances left, and looking at the remaining games of the top teams, UMD moving above #3 in the conference will be difficult. Michigan Tech finally broke their winless streak by taking a game in Denver 3-2. The Huskies averted breaking the conference losing streak record with the win also. In the Saturday rematch, the Huskies may have started a new losing streak aided by a Pioneer goal from 190 feet on Kevin Genoe. Bemidji State may be getting ready for a late season run by getting into the swing of things with a three point weekend at home against Colorado College. The real story of that series is the damage done to CC’s home ice aspirations as they become more entrenched at #7 in the conference. Is it a Wisconsin fall or a UMTC rising? After surrendering three pints to the badgers in Minneapolis earlier this season, the Gophers returned the favor in Madison. What may be most telling in this series is Wisconsin is now winless in their last four going 0-3-1. Even with players out of the lineup, North Dakota still rolls on. Traveling to Saint Cloud State proved to have one small bump in the road as they tied Friday night before a Sioux win on Saturday. Finally, the Seawolves followed a trend this year by not being swept at home this season. Omaha was the latest team to travel to UAA and come away with a spilt, Anchorage winning Friday 3-2 and UNO Saturday 4-1. The Bulldogs are heralded as outscoring their opponents 72-48 from the second period on this season. That stat didn’t change tonight, but it didn’t help either. Minnesota State – Mankato won the first period 3-1 to defeat the visiting Bulldogs by the same score. The lone UMD goal was scored by Mike Connolly, his tam leading 20th of the season, with the lone assist to Jack Connolly, his team leading 32nd of the season. It was another slow start for UMD and that cost them the game as the offense had their chances, but couldn’t convert. Shots on goal for the game were dominated by UMD, 41-27. In the third period alone the Bulldogs outshot the Mavericks 28-5, but the score never changed after the first period. The players’ quotes sound eerily similar to last Friday’s after the 8-2 shellacking at the hands of Saint Cloud State in Duluth. Talk of the game being an aberration and that the team is better than the score showed. Talk of how the team will turn it around. Well, there isn’t time to talk about it, the turn around has to start Saturday in Mankato. The Bulldogs are still currently tied for fourth in the WCHA with Omaha who is playing the late game in Alaska tonight. UMD squandered a chance to move up in the conference as Michigan Tech ended their winless streak at 26 games by defeating Denver in Colorado 3-2. Tomorrow night is gut-check time. The garbage of coming out looking unprepared and unmotivated for games has to stop, or it will become the identity of the team. The players should have some time tonight to think about what they built in the beginning of the year and step back to see how quickly it can be torn down. Tomorrow night’s rematch will put UMD’s streak of not losing two straight games this season to the test. Tonight’s box score from the WCHA. Time to get down to business, both for the Bulldogs and for me to get this article completed. The Bulldogs are getting down the final stretch of the regular season. After a season when things went so well at the beginning, the past two series haven’t gone well. UMD is 1-1-2 in those series, but it is against lower tier teams SCSU and UMTC. And those series were at home for the Bulldogs. On the Road Again, Great! 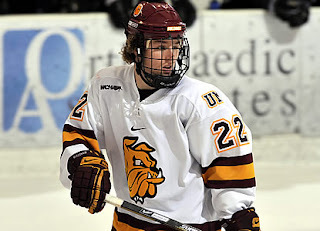 The Bulldogs since the start of 2011, UMD is 4-0-0 on the road as compared to 2-2-2 at home during the same time. For the season, UMD is 9-2-3 on the road and 9-4-2 at home, go figure. Goaltending is Key. We hear it all the time when the season winds down that goaltending needs to be great to go far in the postseason. Just look at the first headline at USCHO, “In Stretch Run, Focus is on the Net: As the regular season winds down, the importance of getting good goaltending ramps up.” That idea may have UMD fans a little fidgety. Goaltending and total team defense was suspect for the last three games in which UMD went 1-1-1. In their only win, 6-4 against UMTC, the Bulldogs led 3-0 and had the game in control until Gopher goals started coming. At the end, the Gophers pulled within one at 5-4 with less than two minutes to go before a Bulldog empty-netter. It doesn’t take a rocket scientist to see that the defense gave it up last Saturday in the 8-2 loss to SCSU. But that was an aberration, or so says the Bulldog quotes after the game. It continued to a 3-0 deficit the next night before the game ended in a 3-3 tie. Team defense, now without blueliner Brady Lamb, will have to get better starting now. Mavs on a Streak. Mankato has been on a losing streak against the Bulldogs. 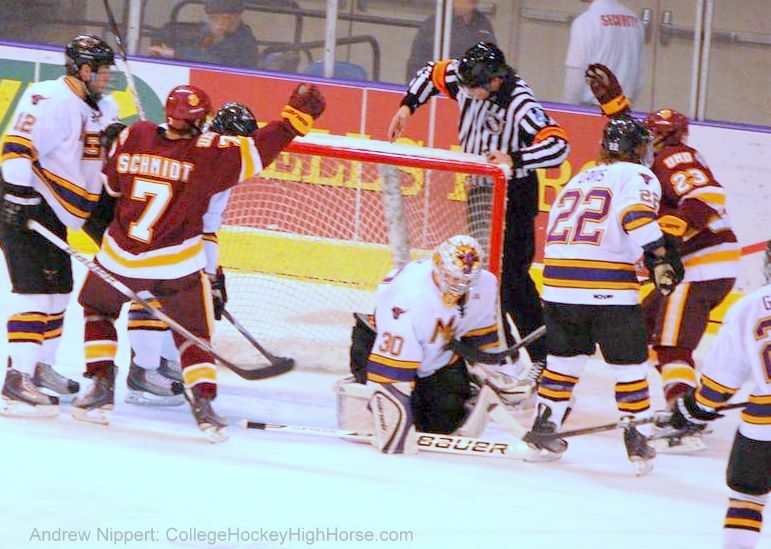 UMD is currently on a 7-1-0 streak against MSUM since a 2-1 loss in Mankato December 1, 2007. Prior to the current streak, UMD has had trouble in Mankato. From 2000 to 2007, UMD is 3-5-6 at Mankato. Score First. UMD lost their first game this season when scoring the first goal last Saturday night. On the season UMD is now 12-1-1 when tallying the first goal. Outlook. This will be a very challenging weekend for the Bulldogs. It is time to turn it on if the team has “it.” Injuries, struggles on defense and goaltending will lead to more struggles as UMD splits with MSUM. Around the WCHA. Another full weekend of conference play. #3North Dakota at Saint Cloud State: Which Huskies team will we see this weekend? They are more erratic than UMTC. That being said, the teams in the WCHA are very even this year and SCSU is difficult to sweep at home. We see a split at Saint Cloud. Michigan Tech at #4 Denver: Denver rolls on sweeping Tech in the Mile High City. #7 Nebraska – Omaha at Alaska – Anchorage: Omaha has become hot after a cool streak, but this is a trip to the Last Frontier. Split for these teams. UMTC at #15 Wisconsin: UMTC should be able to hold it together for a full 60 minutes for at least one of the games right? Yeah, but just one, so this is a split. #17 Colorado College at Bemidji State: CC is waiting for Jaden Schwartz to come back, likely just in time for UMD to come into town. That along with a trip to Northern Minnesota equals a split. The Huskies of SCSU are back in town. That is a notable mark as this is their first game in Duluth since November of 2008, a scheduling quirk indeed. The last time we covered a Huskies game was last March in Saint Paul for the NCAA West Regional Championship. Things have definitely changed from last year to this year for the Huskies. The Huskies accomplishments last season include finishing third in the league, ending their NCAA Tournament loss streak (it was actually their first NCAA win), and sending Ryan Latsch to the top of all time Huskies scorers. It was a banner year to work into the future. So what happened? SCSU is currently tied for 10th place in the now 12 team WCHA, rank 11th in the WCHA in team defense (3.04 goals allowed per game), rank 357th in the nation in scoring with 2.71 goals per game and their top point getter, Drew LeBlanc, is 11-23-34 (6th WCHA, 21st nationally). It has really been a perfect storm that has hit Saint Cloud. Loss of scoring talent through graduation (Latsch and Garret Raboin), the academic ineligibility first semester of sophomore David Eddy who was the leading freshman scorer, and the midseason dismissal of two players has left the lineup in constant flux. Additionally, the erratic play of the defense, especially the once dubbed dynamic goaltending dup of Mike Lee and Dan Dunn, leaves SCSU in the hole they are in. SCSU is no cupcake, though. They have put up a streak in over Christmas break extending into 2011 when they put together a six game win streak against teams like Cornell and Miami, but also against lower half WCHA teams BSU and MTU. The team just can’t get to even, currently 11-14-3 (7-11-2 WCHA). Power is Key for UMD. Special teams will be important throughout the end of the season. Currently the Bulldogs are staying almost steady, but losing a little ground in the power play department, now at #14 in the nation with 20.83%. The penalty kill is surging behind a current kill streak of 38 of 41 (92.7%). That streak has improved UMD to 84.8%, 13th in the nation. 2011 is Good. The Bulldogs are 9-1-1 in the new year. The loss and tie have both come at AMSOIL Arena. Gaoltending! Reiter was strong in net last weekend and may have solidified the starting job the whole weekend. Crandall does need more experience and that is where the question comes in: When do you stop developing a backup and start preparing a goalie ready for the postseason push? It has to be one of these weekends soon, because reiter will be tested this postseson. Bottom Line. UMD is still rising as seen with the reunification of the FCC line last weekend. The Bulldogs are playing for the coveted McNaughton Cup and a potential bye in the first round of the new format Final Five. The Bulldogs will take advantage of a reeling SCSU team and complete their first sweep at AMSOIL Arena. Around the WCHA. All 12 teams are engaged in conference play this weekend, with only four weekends left in the regular season. Alaska – Anchorage at #5 North Dakota: North Dakota was really banged up before last weekend which they had off. Some players have returned, but some key players, Kristo and Genoway, are still out. Coach Hakstol has gone so far as to say he is not happy with the distraction that the Kristo injury has caused and that he will turn his attention to the 26 guys he has in Grand Forks. Kristo is still currently in the Twin Cities recovering from frostbite. Drama on the Prairie leads to a 3 point weekend for UND. #5 Denver at UMTC: This is a tough one for us. It is not often that the staff cannot come to consensus and this is one of those times. After a poor defensive showing at Duluth last weekend and the possibility of Barribal out for the weekend, I have a Pioneers sweep in Minneapolis. Andy sees UMTC using some home cooking to salvage a split. #7 Wisconsin at #14 Nebraska – Omaha: This looks to be the marquee match-up of the weekend. Wisconsin is really turning on the heat making a run tot the top of the PWR and WCHA. The Badgers are currently two points behind the Mavs in the conference and UNO is having trouble finding a groove. If Mavs goalie Faulkner is on his game, UNO could squeak out a split. The most likely scenario is UW’s netminder Gudmandson will be great and UNO’s home ice advantage will make this a 3 pointer for Wisconsin. Minnesota State – Mankato at #18 Colorado College: The Tigers of CC are still trying to move up in t PWR, but just can’t seem to do that. MSUM may seem like a good opponent to make some hay against, but the Mavs have been playing inspired hockey as of late. The end result is CC won’t move up when they split with Mankato. Bemidji State at Michigan Technological University: Whether the Huskies are good or bad, and this season has been bad, Winter Carnival Weekend in Houghton always seems to bring something more out of the home Huskies. Bemidji has been muddling around the bottom of the WCHA with Tech all season and now they finally meet. Carnival mojo brings an end to Techs winless streak in a split. It truly was Mike’s night as the offenses were showcased Saturday night in Duluth. Led by Mike Connolly’s school tying record five goals, the Bulldogs skated away with a 6-4 win over the Gophers. The pace was fast making for a very entertaining game as the teams combined for 76 shot on goal, 40 of them for UMD. Just as Friday night’s game, the Bulldogs controlled play for most of the game. Saturday the work paid off in scoring. The Bulldogs never trailed in the game leading 2-0 after one period and 4-2 after the second. In a shake up of the lines for UMD, Coach Sandelin reunited the FCC line (Fontaine, Jack Connolly, Mike Connolly) and the results were overwhelming. “I never thought I would score this many goals (in a game),” Connolly said. He also had a goal in the Friday night game. In addition to Mike’s five goals, Jack had four assists and Fontaine had three assists on the night. The total of 12 points is quite the jump the Bulldogs were looking for. The other Bulldog goal was tallied by Travis Oleksuk and proved to be the game winner. Aaron Crandall got the start in net for UMD and played well enough in making 32 saves to get the win. At times he looked out of sorts and had bad angles in the net. The game never really felt in hand as UMTC pulled within one goal, 5-4, with the extra attacker with 1:35 left in the third. The goal scored by Nate Condon was a tip in front into a wide open half of the Bulldog net. Kent Patterson made 34 saves for the Gophers and was tested early and often. Saturday, unlike Friday, the Bulldogs, Mike Connolly mainly, got to him and kept him busy with sustained pressure in the Gopher end. Moving forward, the challenge now is to increase scoring on the second and third line now that the FCC line is back again. In the past the FCC line has come and gone depending on how other teams match up against the top line to neutralize them. To break that trend, the other lines need to chip in goals to make opponents worry about at least two lines scoring regularly. The Bulldogs host Saint Cloud State at AMSOIL next weekend. Box score from the WCHA. The Bulldogs played well tonight but only have a tie to show for it. Friday against the Gophers at AMSOIL Arena ends 2-2. Throughout the game, UMD showed their speed and ability to move the puck. The problem for the Bulldogs was the play of Gopher netminder Kent Patterson was equally as good. Patterson completed the night with 40 saves, many of which resulted during heavy Bulldog offensive pressure. In the third period alone, UMD racked up the unofficial stat of scoring chances keeping a great fore check at an up-tempo speed. The best scoring chance coming from a great pass from JT Brown that was tipped just high of the cross bar by Justin Fontaine late in the period. So close, and yet a tie. UMD had their struggles at times in the game. At least four definite defensive breakdowns, by my count, were committed by the Bulldogs in their own zone. The most egregious directly resulted in the second Gopher goal at 8:42 of the second period from a half-hearted breakout pass. Kenny Reiter, like Patterson, did a great job in net doing everything he could to keep what few scoring chances (again that unofficial stat) the Gophers had, out of the net. As it turned out, Reiter was solid in making 36 saves. This game was controlled by the Bulldogs, especially in the third period. The saving grace for the Gophers was Patterson. Look for UMD to come out tomorrow night with more energy and more pressure. The “blood was in the water” tonight and the Bulldogs need to finish off the Gophers in the weekend finale. We may have our timing off a little. Nonetheless, we continue to evaluate the season at the trimester level. By our fuzzy math, this weekend starts the last third of the season as the Bulldogs host the Gophers. Offense: The offensive production has slowed. When last graded the Bulldogs were 4th in the nation in scoring; now they are 12th. Their goals per game is nothing to scoff at, currently 3.48. But this team is built for scoring especially with sometimes inconsistent defensive play. We applaud the line changes to spread out talent, and so far it has seemed to work. In the end, scoring is the key to UMD going far and we see diminished returns and room for improvement, B+. Team Defense: Losing Dylan Olsen over the New Year break hurts this aspect of the game. The team has responded well and players have definitely stepped up, gaining the all important confidence at the same time. Since the last grading period, the Bulldogs have dropped their goals against from 2.50 to 2.28, good for 11th in the nation. Defense is looking to get stronger as the year goes on, A-. Special Teams: This is the one area that has definitely improved. Scoring on the power play wasn’t really ever a concern, but penalty kill was. The Bulldogs have moved up to #18 in the nation on PK and are only behind Denver and CC in the WCHA. PP has dropped a little also, but is still above 21% and ranks #11 in the country and third in the WCHA. Maybe the bonus of it all is the 9 shorthanded goals, but the kicker is the penalty minutes per game, 16.12. We give a B+. Goaltending: The area most improved is goaltending. The goalie, Reiter and Crandall, both need more experience. And as expected they have progressed well over the season. Both are well over 0.900 saves percentage, our key indicator. Coach Sandelin still hasn’t picked one to go with, so both are getting time and experience. We give them an A-. In reading over this grading article I am found asking myself if we expect too much. The simple answer is no. This team has been prepping for a run into April for two years now, and this is likely the best shot at achieving that goal. Last grading period we gave the overall team an A- and we will stick with that for now, keeping expectations high. Last grading period is TBD, we look forward to it being in April.